WhiteSmoke has been reviewed for its linguistic capabilities and overall benefits by the largest educational firms around the world. It has been rated as the number-one solution for English grammar, style, spelling and punctuation corrections on the market. Moreover, our innovative business solutions allow us to serve the largest corporations with custom, tailor made applications based on specific needs to improve the quality of daily business transactions and all English correspondence. Most importantly, WhiteSmoke is a dynamic program. Our R&D team releases content updates on a monthly basis, which are automatically available to all of our users. We offer a stand-alone desktop client for Windows and Mac, browser-based web-widgets, and direct access to our grammar engine through an API. Desktop client licenses of WhiteSmoke Writer: A discounted batch of licenses to be installed on a company's employees' computers. Advanced bulk installation solutions are available. Customized desktop solution: any addition or removal of client-side features, such as adding panels or menus for displaying company-specific content (dictionaries, knowledge base, etc. ); removing translator or templates panel; changing graphic elements to accommodate the company’s needs. Customized online version: supporting additional functionality, such as storing user content on company servers or disabling editing features, and any type of look-and-feel changes. WhiteSmoke offers a comprehensive API that allows companies to integrate WhiteSmoke’s grammar checking technology into their products or platforms. The API grants access to all of WhiteSmoke’s grammar, spelling, punctuation and style corrections, as well as to our various writing enhancement tools, such as enrichment, synonyms and usage examples. This solution is best used to seamlessly integrate WhiteSmoke's content with your own product, such as web-based grading application, desktop editor or mobile English teaching application. We will be happy to provide additional technical details if needed. 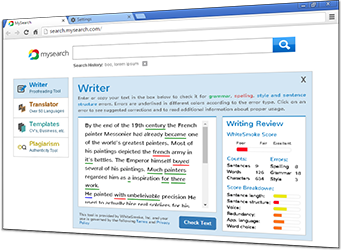 WhiteSmoke can fine-tune and customize the grammar and style corrections it offers to accommodate various types of writing (legal, medical, academic, financial, etc.). Custom dictionaries: adding dictionaries or lexicons enables WhiteSmoke to ignore or flag specific words and offer relevant corrections. Adding rules that adjust sentence phrasing to match the requirements of a specific writing style. Content customizations usually involve a research phase, which requires the customer's cooperation in providing the necessary data, such as dictionaries, text samples, and relevant style guides.